A technology that I am excited about is solar power. Being able to create energy with the sun is something that fascinates me. Putting solar panels on top of RV’s is becoming more and more popular, and the solar panel market has been booming. A recent crash in the solar panel market in China made the prices drop, and it has become more accessible. Today I would like to share the best foldable portable solar panel chargers. These are so portable that you can put them in your backpack and go on a hike. They all go great with portable battery banks, and if you’re interested in the best battery banks on the market, I wrote a post about that last week that you can find by clicking here. If you’re looking for portable solar panels for RV’s, there’s a post coming very soon about that! 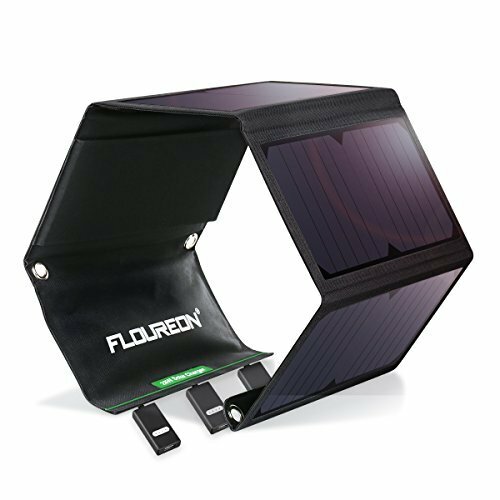 The Floureon 28W foldable solar charger is an impressive product with four solar panels made for camping lovers that want to keep their electronics charged up. 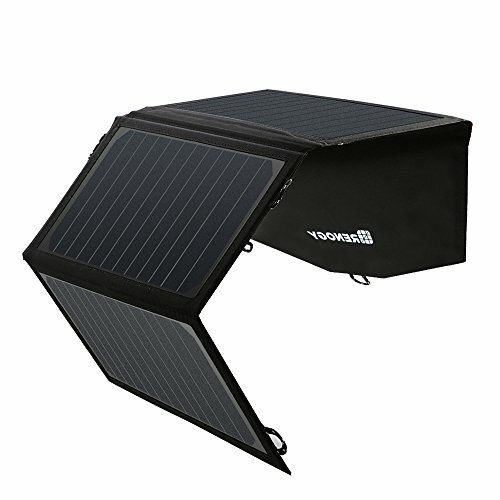 It sports four highly efficient panels and can easily be hung on a tent, backpack, or tree with the included carabiners through the holes found on the ends of the solar charger. If you would rather put it on the ground, you can do so with the built-in stand. Three USB-A ports will charge your devices, rated at 5V/2.4A which means up to 7.2A max simultaneous charging. If those numbers don’t make any sense to you, I can tell you that it’s enough to charge a phone quickly. If you have an iPhone, the included wall charger that came with it is rated at 5V/1A, so in the right conditions, the Floureon solar charger will be twice as fast. IPX4 waterproof rating means that it can take a splash or two without damaging the panels or ports. It has a neat little pocket where you can store your device while it’s charging. I recommend putting your device in the shade or under the panel though and not leave any part of the phone directly in sunlight as you risk overheating it. At 2.1 lbs, it’s heavier than some of the other models, but remember that it has four panels and three USB ports, something that you won’t find on a lot of solar panel chargers at this price point. The FLOUREON Solar Charger has left a great impression on me and is a good option. It’s not the lightest of the bunch, so if you plan on taking it on hikes, you might want a lighter choice. With three USB ports you can leave it at the camp and charge not only your phone but your friends’ phones as well. If you have ever looked at solar panels, there is a big chance that you have seen products from a brand called Renogy. They are known for their bigger panels and often praised for their high quality and customer support. Lucky us, they also make a smaller foldable portable solar charger. It’s a three-panel setup rated at 21 watts. Two USB ports will let you charge two devices at once, and each port is rated at 5V/2.1A. Put it on your backpack and go on a hike while your phone is charging inside. It only weighs 1.04 pounds, so it’s a great hiking choice. The solar charger is made out of water-resistant and durable panels and fabrics, so even though you shouldn’t leave it out in light rain, it can handle it. A pocket next to the panels will hold your phone while it’s charging, but I recommend putting it under the panel, clear out of the sun to not damage the phone batteries from excessive heat. Four eyeholes along the sides will let you hang the panel in a tree, on a tent, a backpack, or whatever spot you may find where you can tie a rope. So why go with a Renogy panel? Well, they’re known for their excellent customer support and solid panels so I can recommend their product with confidence. It’s not the highest rated panel on today’s list, but it’s a good solar charger for the hiker or backpacker that cares more about weight. It’s still rated high enough to charge a phone or two so don’t underestimate it. The Renogy Solar Panel comes with a micro USB cable. One of the most popular solar chargers on the market is this product from BigBlue. It’s a four-panel setup rated at 28 watts. Two USB ports rated at 5V/2.4A can charge two devices at once and has enough power to quickly charge up a phone or two. Carabiners are included to make it easy for you to hang the solar charger on your tent, a backpack or a tree. Four holes have been put in the fabric for this purpose. There is no need to worry about damaging the panel as it’s very durable and water resistant with its IPX5 rating. My favorite feature on this panel is a tiny screen that will show you how many amps are currently being received from the sun. I’m using a separate USB accessory to get this information with my old solar panel, so I am glad to see it built-in to a product. The BigBlue Solar Charger has the best implementation of a pocket for your phone, with a band to hold it in place and a zipper to close the pocket. I wouldn’t have minded a slightly bigger pocket for bigger phones. Since this is the second 28W solar charger on the list, I thought we could compare them a little. Flureon has the advantage when it comes to ports with three ports, but the BigBlue has a screen showing the amps and a better pocket for your phone. The BigBlue is lighter and comes with a Micro USB cable. Both have four panels. Which one is better? You will have to decide if two USB ports are enough and if the weight matters to you. 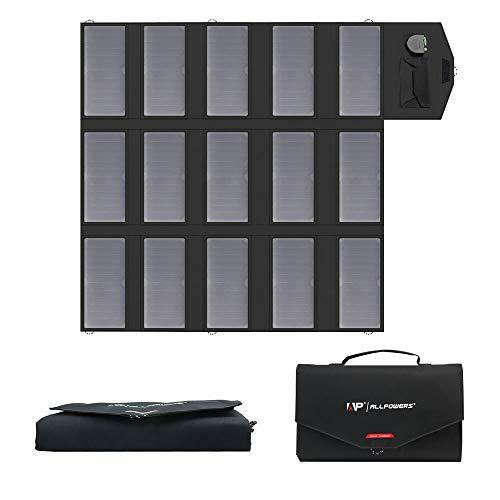 I have earlier recommended the RAVPower battery bank in my post about the best battery banks for camping, and I know for a fact that their power banks work great with this solar panel, so if you’re planning on buying a power bank + solar setup, that is one that I recommend. The RAVPower solar charger is rated for 24 watts and has three USB ports. It’s a four-panel setup with as efficient panels like the other products to charge your devices quickly. The USB ports can output up to 4.8A overall with up to 2.4A per port. It’s not a panel that sticks out when compared to the earlier products, and it doesn’t have any frills. It has a fairly big pocket where you can keep your device while it’s charging, and four holes to make it easy to hang on your tent, backpack or a tree. The panels and the fabrics used are durable and lightweight enough for a hike. It comes with two micro USB cables and four carabiners. At this price point, I would have liked to see a screen showing amps or a better pocket, but I am still confident in recommending this product because I have seen it in action and it’s a very capable solar charger that does its job reliably. So why is the RAVPower panel even on the list? Because it works great. It’s efficient and it’s not advertised as something it isn’t. You can find cheaper panels that claim that they can output the same amps and wattage, but in the real world, they underperform. RAVPower has made a solar charger that delivers and if you need a product you can rely on, this is my top recommendation. If you’re here looking for more power and a solar charger with more uses, I hope these last two will fit the bill. Starting with this Suaoki 60W panel. With nine durable monocrystalline solar panels, this is a solar charger that can charge more than your phone and tablet. It comes with ten different laptop connectors, a 12V car cigarette plug, two DC to DC cables, one DC to SAE cable, and an SAE to Clamp connector for a direct connection to 12v batteries. All of these cables are connected to the DC output rated at 18V/3.4A. But that’s not all, there’s also a USB port rated at 5V/2.1A. A large pocket with a zipper will hold your devices while they are charging in a dry and clean pocket. 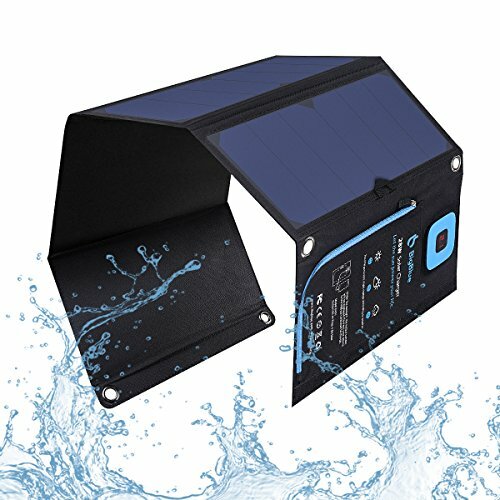 The solar charger itself can get dirty and wet and still work great since it’s made with durable materials. The Suaoki 60W solar charger weighs 3.10 pounds but for the power output it’s capable of, it’s not bad. I like this one because it’s very versatile. Even though it’s foldable and can go into a small backpack, it can unfold and charge everything from phones to cars and solar generators. The fact that you get all the cables you need to charge all your devices and even an RV battery is part of the reason why this is one of my top picks. The only thing I would have liked to see done differently is the way the panels unfold. It would’ve been smarter, in my opinion, to put the panels next to each other in more directions like the Allpowers panel below. That way it would be easier to hang it on a tent or put it on a table. One last thing that I want you to note about the Suaoki 60W panel is the big built-in handle that lets you carry the solar charger with ease. It’s something I have realized would’ve been nice to have on my current charger as well. If nine panels aren’t enough for you, how about 15? Or if 60W isn’t enough, how about 100W? This Allpowers 100W solar charger is the most powerful panel on today’s list and is very impressive for being a foldable charger. So will 100W charge your phone even faster through USB? Well, it’s a little bit more complicated than that. The two USB ports are still rated at 5V/2.4A per port, but what 100W will do for you is be more reliable. A smaller panel’s ports can be rated for the same volts and amps but not be able to put out that power unless in perfect sunny conditions. A charger of this size will be more forgiving and put out more energy in worse conditions. Other than the two USB ports, you will find a DC output rated at 18V/5A. That is powerful enough to charge laptops. Ten different laptop power connectors are included so if you have a somewhat popular brand, there should be one that is compatible. What I am missing from the Allpowers 100W kit is a DC to clamp cable to be able to charge up an RV battery. This is where Suaoki has done a better job. So what do you get from Allpowers that you don’t get with Suaoki? Well, 40W more of solar panels and two USB ports instead of one. If that sounds worth it, it could very well be the best portable solar charger for you. Which solar charger is best for you depends on what you need. If you need something lightweight so you can charge your devices on a hike, the smaller models are the best. If you want a charger that charges your laptop, RV, and all your USB devices, a larger will be the best. It might sound obvious, but I want to remind you to consider what you will need most of the time and pick the right one for your needs. My Choice: RAVPower Solar Charger 24W – A cheaper charger might be rated for the same watts, but not as reliable as the RAVPower Solar Charger. After trying several products, the RAVPower is one of the most efficient choices. It doesn’t have any frills, but it does what it’s supposed to do and won’t disappoint. Best All-Around: SUAOKI 60W Portable Sunpower – Suaoki has done a great job with this product and with all the included cables you can keep all your devices, even an RV, charged up. Versatile products are easy to like and this one kicks the competition out of the water in that category. 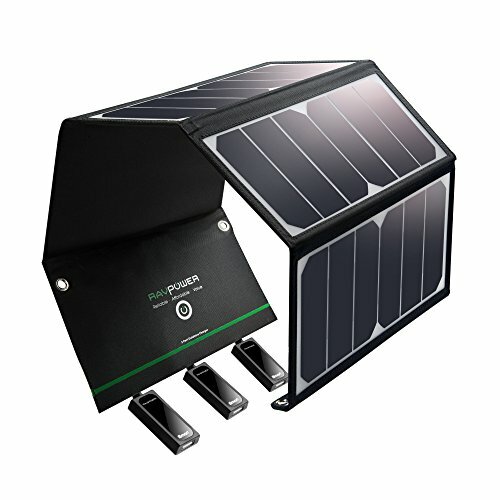 Ports – By knowing ahead what you will be charging most of the time with your solar charger, you can get the one with the ports you need. If you only want to charge your phone, don’t go splurge for one that can charge a car. A 5V/2.4A USB port can do a great job at keeping phones, tablets, and headphones charged as long as the sun is out. Watts – If you’re planning on charging an RV battery or a laptop, wattage will matter. If your laptop charger is rated for 60W, go for a 100W panel. A 60W panel can’t produce 60W of power even in perfect conditions, so be aware of this if you’re mostly looking at the wattage. DC Output – A DC output can put out more power than a USB port. If you plan on charging a car, RV or solar generator battery, you’re going to want a DC output. Weight – The more you’re going to carry it around, the less you want it to weigh. If you want a panel that can keep your phone charged during a hike, don’t get a heavy one that has more features than you need. Size – As with weight, size will matter depending on what and where you will be using it. Putting a 100W charger on a backpack will not only look funny but be very impractical. Look at the measurements of the panel you’re considering and make sure it’s not too big for your specific use. Is it safe for my phone to be left out in the sun with a solar charger? It’s safe as long as you don’t leave the phone itself in the sun. Try putting it underneath the panel or in some shade next to it. Get a longer cable if you can’t keep the phone shaded. You have to be careful with batteries when it comes to heat, and leaving it in the sun while it’s being charged can damage the battery. 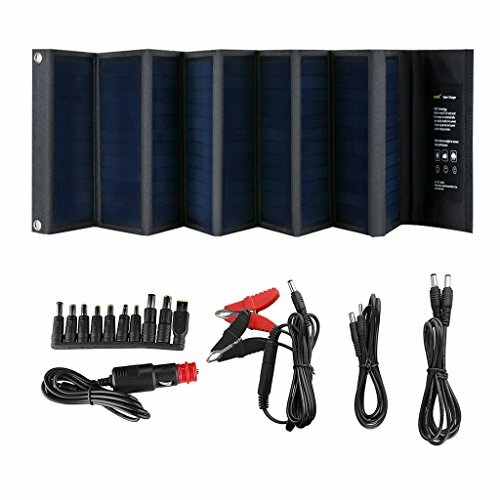 What power banks do you recommend I use with the solar panel? I have written a post about the best power banks that work great with solar chargers, you can find that post by clicking here. Are solar chargers efficient enough to be worth it? Short answer, yes they are. I have been using a 19.5W solar panel to keep my phone, tablet and power bank charged when I have been away from outlets for weeks. They are already powerful and relatively cheap but will become even better and less expensive in the future. Let me know if you have any other questions by leaving a comment down below.